Motocross graphics give your dirt bike a look and style to call your own whether it's a new ride or you're looking to refresh an older model bike looking haggard from well used and worn graphics. 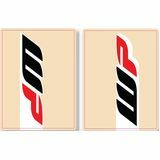 MotoSport offers a wide variety of dirt bike graphics and kits that covers every inch of your bike. Choose from 20 different industry brands including OEM. We also offer custom motocross graphics so you can personalize your name, number, color and AMA logo options. Motocross graphics offer the coolest look and the best way to stand out from the rest of the field. Once you've chosen your decals it's time to pick your plastic. 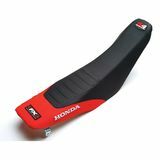 Check out our supply of dirt bike plastics and plastic kits. MotoSport is the best place to get ready for race day and personalize your dirt bike with graphics. We have different styles and selections from a number of the best companies in the business. Our in-house printer allows us to get most orders shipped same day. Give us a call on our toll free line 866-677-7338 if you need some help.